Great gift set. Key chain features three rings for keys. Wallet has one outside pocket and multiple inside pockets. Cognac: MLG0102222. Passport Wallet Case Traveler. Fossil Estate Embossed. Embossed Plane on Front. Interior Details: 4 Credit Card Slots, 2 Bill Pockets, 3 Slip Pockets, 1 ID Window. Genuine Leather. Style # ML3533001. I'm not affiliated with Fossil or with an employee! Material: Leather. 4 Slots to hold Credit Cards and ID. Color: Black. Preowned leather Fossil wallet. The leather is soft and supple. Multiple credit card slots. Zipper pocket on the exterior. Snap clasp. Brand: Fossil Material: Leather Style: BifoldWallet Features: Organizer Color: Dark Brown Category: Wallets Comes from a smoke free home Free shipping! The perfect card case from Fossil is your pocket’s essential plus one to house all your cards and cash with ease. Fossil card case. Features four credit card slots. Leather; lining: cotton. I will respond to all inquiries with a prompt and specific answer. EMMA GOOGLY EYES. Googly Eye Accent. Passport Case Holder Wallet. Burgundy and Pink Leather Passport Holder. Interior features 1 passport pocket, 1 zip pocket, 1 slide pocket and 4 card slots. DESIGNER wallet. COLOR: BLACK. 4 card slots. Height: 2 1⁄2 in. Depth: 1⁄2 in. Bottom Width: 4 in. (never used). Brown leather. 5 card slots. View photos for more details. NWT FOSSIL Leather Passport Organizer - RFID - Black/Blue Floral. 1 interior zip pocket, 1 slide pocket, 4 credit card slots, 1 passport pocket & RFID design to resist electronic scanning. Lot of 10 Empty Tin boxes for Money Clipper Card Case wallets. 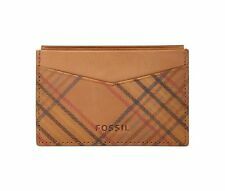 FOSSIL Brown Leather Combination Magnetic Money Clip & Card Holder Wallet. 3 exterior card slots. Side entry slide pocket. Genuine soft Fossil leather. Interior features passport pocket, 4 card slots, ID window, 2 slip pockets, 2 full length bill folds and a zippered pocket. WEEKEND SALE! NWT Fossil Brown Leather PASSPORT SLEEVE - LAST ONE! Made of rich brown cowhide leather. Two credit card slots and a passport slot. FOSSIL Leather Bifold Business/Credit Card Holder Brown Stripe Men's Slim Nice! BROWN TAN LEATHER WITH GREEN STRIPES. SLIM DESIGN. 6 CARD SLOTS. Passport Cover Holder Wallet Case. Blue Black Floral Flowers. Original Owner - Smoke Free. Lot of 20 Empty Tin boxes for long check book holder wallets. 95046 Palagonia (CT). Via Roma 21. di Mario e Claudia Terranova s.n.c. Gioielleria Cunsolo. Ingram RFID Bifold Wallet with Flip ID. When you need to tote just the essentials, our slim Ingram holds credit and folded bills in a pared-down silhouette. Bifold Silhouette. Rich Genuine Cowhide Leather. Ellis Magnetic Card Case. Silhouette: Magnetic Card Case. This leather card case features four exterior credit card slots and novelty details. Exterior Material: Leather. Exterior Details: 4 Credit Card Slots. Ingram RFID 2-in-1 Bifold Cardcase Wallet. Precisely crafted in dark smooth leather with a front slide out card case, this piece is a standout. Silhouette: Bifold. Debossed Fossil Logo. Exterior Material: Leather.